The Compulsive Reader: Eve On Sale! 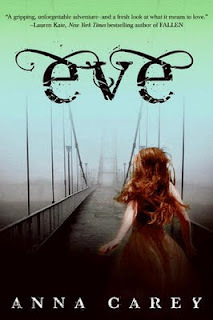 One of the books that had some good buzz last summer was Anna Carey's Eve. I enjoyed it quite a bit--it's a very engrossing and quick read. It'll be out in paperback next month, along with the sequel, Once! If you haven't started this trilogy yet, I recommend that you do so ASAP...and for a limited time, the e-book version of Eve is available for $2.99! Click here to read my review of Eve, and stay tuned for more about Once and the official blog tour!